Our group photo was probably taken by professional photographer Debi H. our dear Dharma sister in the USA, known for her amazing photos, etc. We're posed with His Eminence, Khenchen Palden Sherab Rinpoche (center) and his brother, Khenpo Tsewang Rinpoche at the auspicious Stupa in Deer Park, Varanasi. 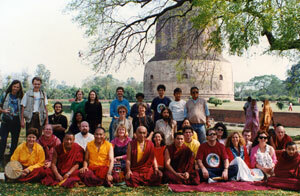 Sarnath, where Buddha first turned the Wheel of Dharma. 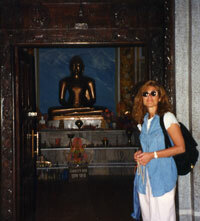 I was incredibly fortunate to view an actual tiny bone relic of Buddha Shakymuni inside this Stupa. We all circled around it while reciting prayers and mantras. What a wonderful way to begin our pilgrimage! this journey to India… with Khenchen Palden Sherab Rinpoche, my heart-friend and spiritual-father. 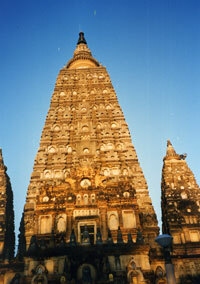 Bodhgaya, the place of Buddha's enlightenment is commemorated by this giant Stupa, it's near the famous Bodhi Tree. This is one of my many pictures of India. The photo below was probably taken by my Dharma friend Janie who is a great supporter of the Padmasambhava Buddhist Center. I'm inside the great Stupa doing some sacred practice of mantras with my mala beads. 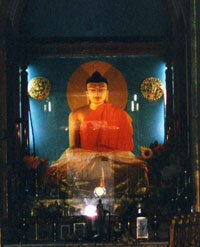 I took this photo of Buddha inside the great Stupa at Bodhgaya -- a powerful place. I've more images to help inspire you. Perhaps one day you'll plan a pilgrimage of your own? Wherever you do go in this wonderful world remember a journey to India is a trip!